A U.S. Army HMMWV provides security for the 1st Attack Reconnaissance Battalion, 25th Combat Aviation Brigade's forward staging area at Fort Irwin, California. 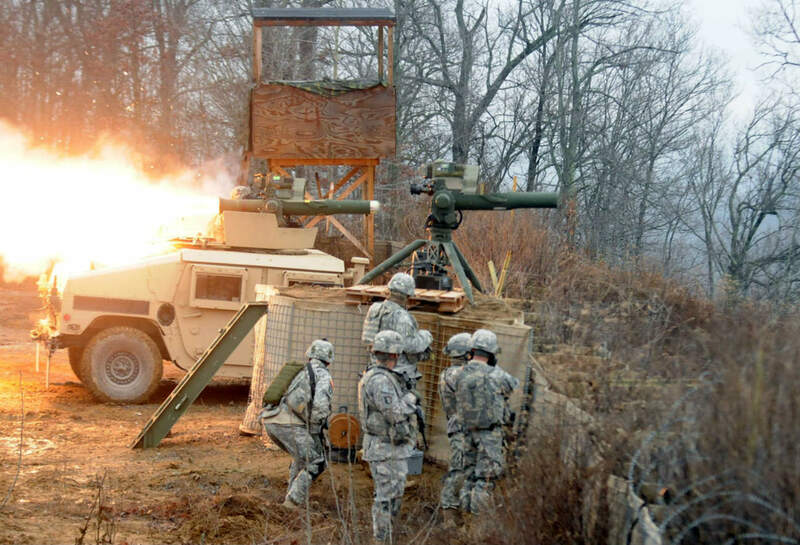 This is 1-25th ARB's first rotation at the National Training Center. 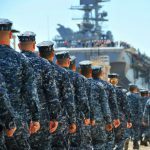 NTC provides U.S. military units and personnel with realistic pre-deployment training scenarios in all aspects of armed conflict. 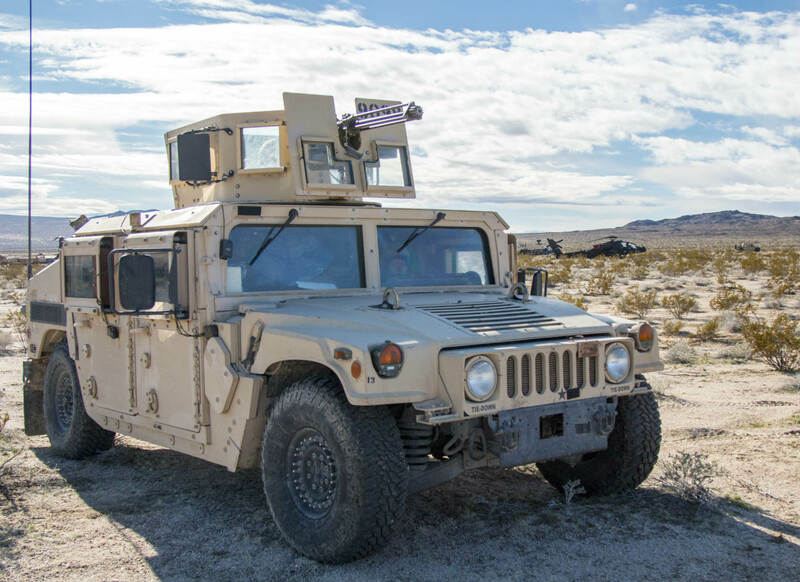 A U.S. Army HMMWV provides security for the 1st Attack Reconnaissance Battalion, 25th Combat Aviation Brigade’s forward staging area at Fort Irwin. These images of Humvees were photographed by military veterans and service members. 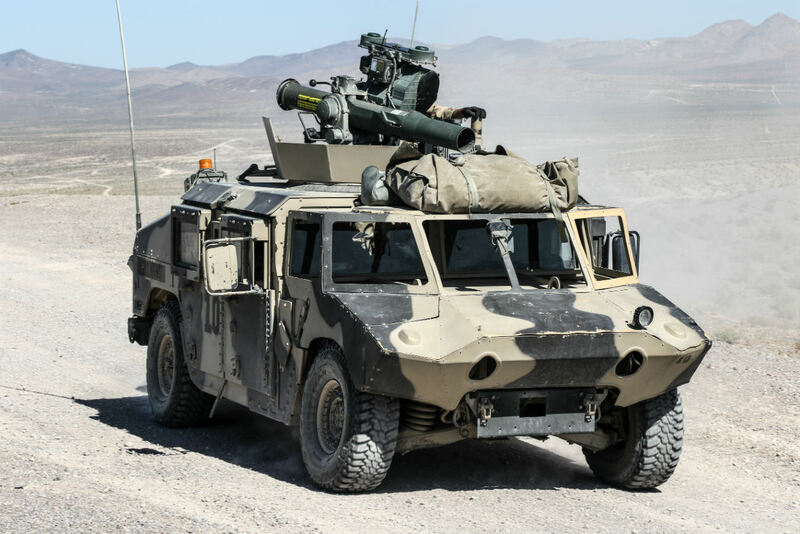 This M1151 was the first HMMWV to carry the new FRAG Kit 6 that is being produced at the Rock Island Arsenal Joint Manufacturing and Technology Center. The first FRAG Kit 6. U.S. Army Soldiers patrol through rugged terrain in a humvee in the mountains of Tagab Valley, Kapisa Province, Afghanistan. U.S. Army Soldiers patrol through rugged terrain in a humvee. 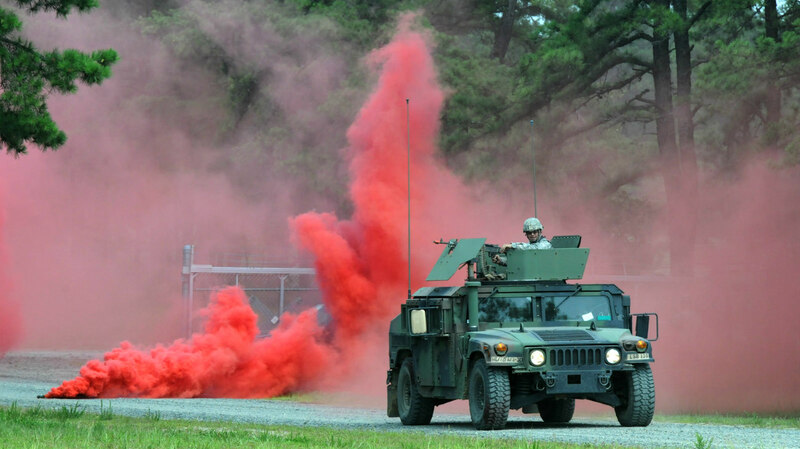 A Humvee rolls through a smoke screen during convoy lanes training during Operation Sustainment Warrior 2014 Joint Base McGuire-Dix-Lakehurst, New Jersey. OSW is an annual Army Reserve training hosted this year by the 655th Regional Support Group, Chicopee, Mass., designed to provide rigorous and relevant individual training that improves Soldier readiness and retention. 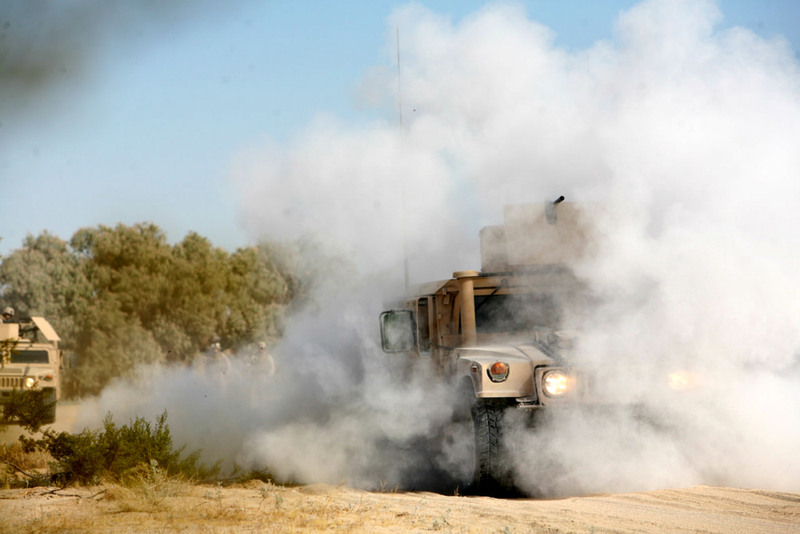 A Humvee rolls through a smoke screen during convoy lanes training during Operation Sustainment Warrior. Marines and sailors with the 24th Marine Expeditionary Unit drive Humvees toward the border of the Kingdom of Jordan after offloading from the Maritime Prepositioning Fleet ship USNS Sgt. William R. Button here, during an MPF offload exercise in support of Exercise Eager Lion 12. Marines and sailors from the 24th Marine Expeditionary Unit and Iwo Jima Amphibious Ready Group assisted the Combined Forces Maritime Component Command, or CFMCC, during the exercise as part of their current deployment to the U.S. Central Command area of operations as a theater reserve and crisis response force. 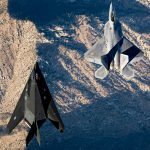 Eager Lion is a recurring, multinational exercise designed to strengthen military-to-military relationships among partnered nations through scenario-based, realistic modern-day security challenges. 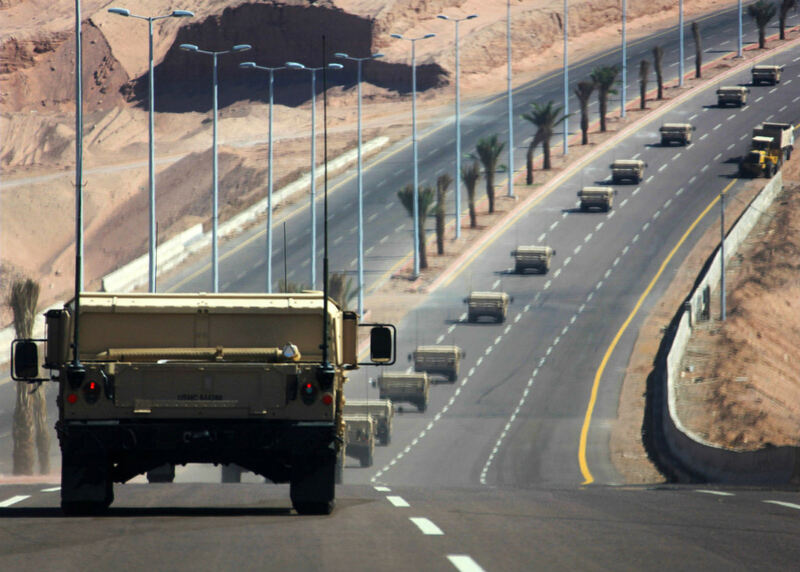 Marines and sailors with the 24th Marine Expeditionary Unit drive Humvees toward the border of the Kingdom of Jordan. 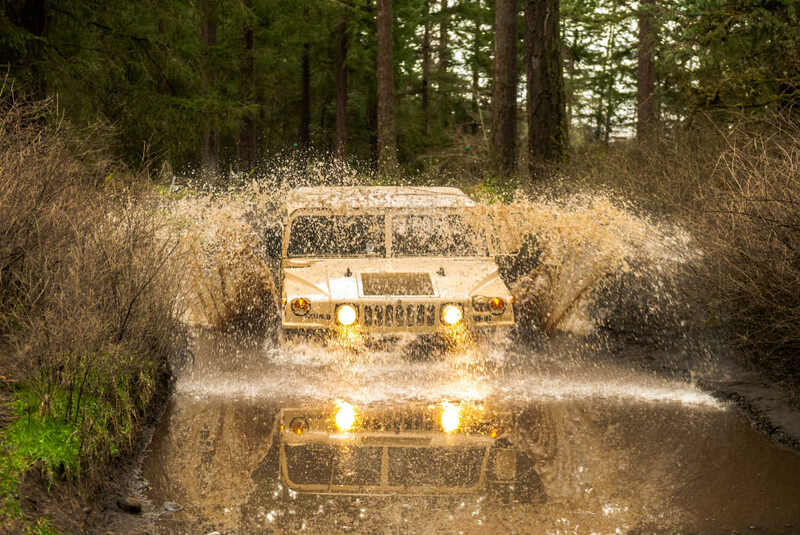 These images of Humvees were photographed by military veterans and service members. A humvee is struck by a simulated improvised explosive device during an IED lane training exercise at Range 102 as part of Regimental Combat Team 7's pre-deployment training exercise. A humvee is struck by a simulated improvised explosive device during an IED lane training exercise. 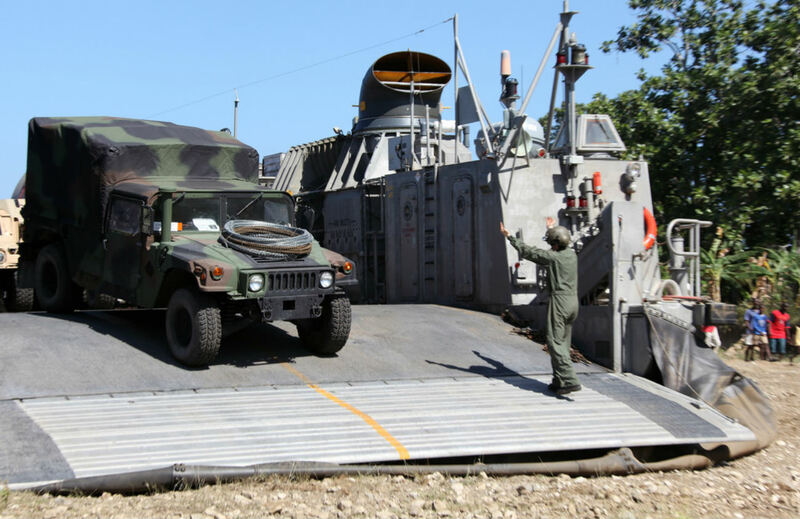 A Navy loadmaster from Assault Craft Unit 4 guides a 22nd Marine Expeditionary Unit humvee off a Navy Landing Craft Air Cushioned onto a Haitian Beach. The landing craft allows 22nd Marine Expeditionary Unit Marines to deliver heavy equipment and supplies faster and more efficiently than alternative landing craft. 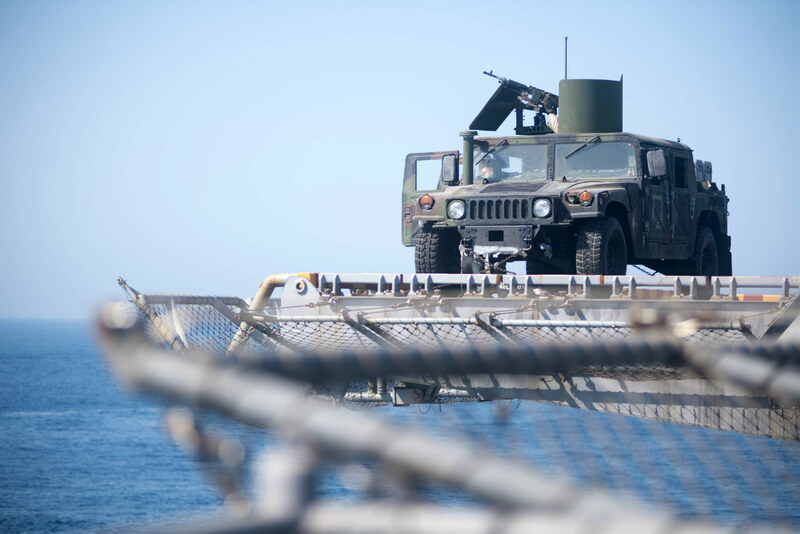 A Navy loadmaster from Assault Craft Unit 4 guides a 22nd Marine Expeditionary Unit humvee off a Navy Landing Craft Air Cushion. U.S. Army Spc. 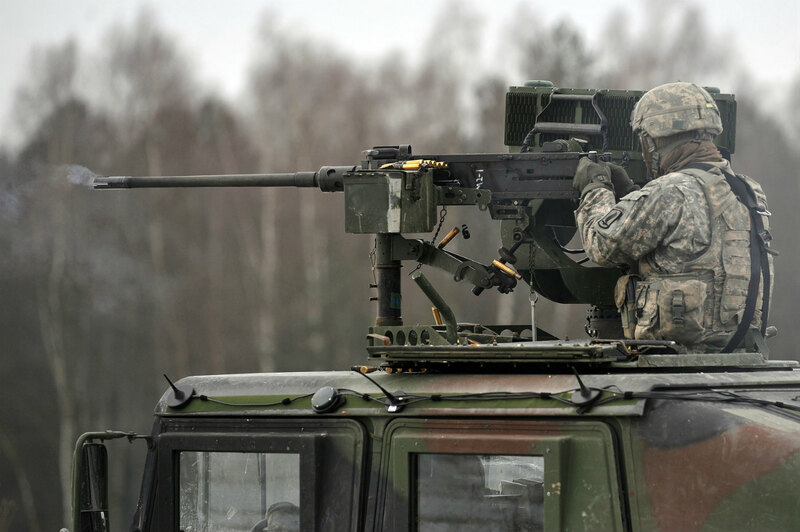 Justin Barnett, a paratrooper assigned to 1st Squadron, 91st Cavalry Regiment, 173rd Infantry Brigade Combat Team (Airborne), fires a .50-caliber machine gun from a High Mobility Multipurpose Wheeled Vehicle during platoon-level live fire exercise at the 7th Army Joint Multinational Training Command’s Grafenwoehr Training Area, Germany. A soldier fires a .50-caliber machine gun from a High Mobility Multipurpose Wheeled Vehicle during platoon-level live fire exercise. Reserve Soldiers from the greater Chicago area drive M1165A1 High Mobility Multi-purpose Wheeled Vehicles (HMMWV) on an off-road driving course to gain practice on the HMMWV in various rough terrain conditions at the Joliet Training Area, Illinois. 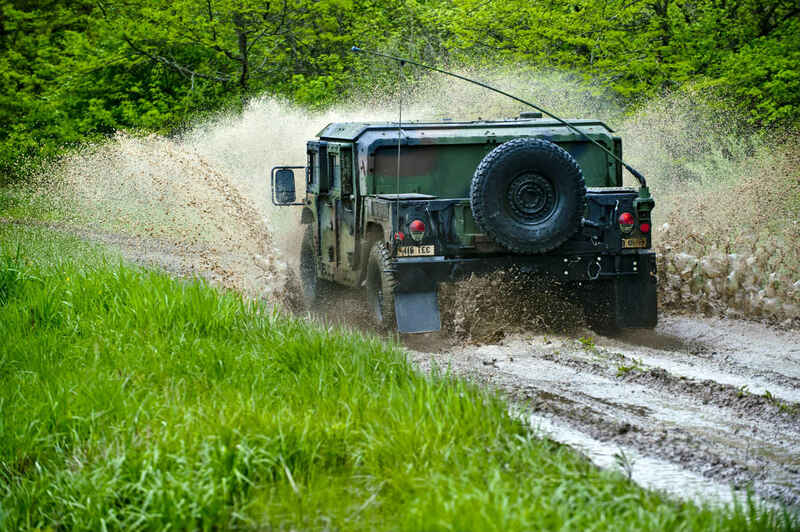 The course was taught by driving instructors from the 416th Theater Engineer Command, headquartered in Darien, Ill. 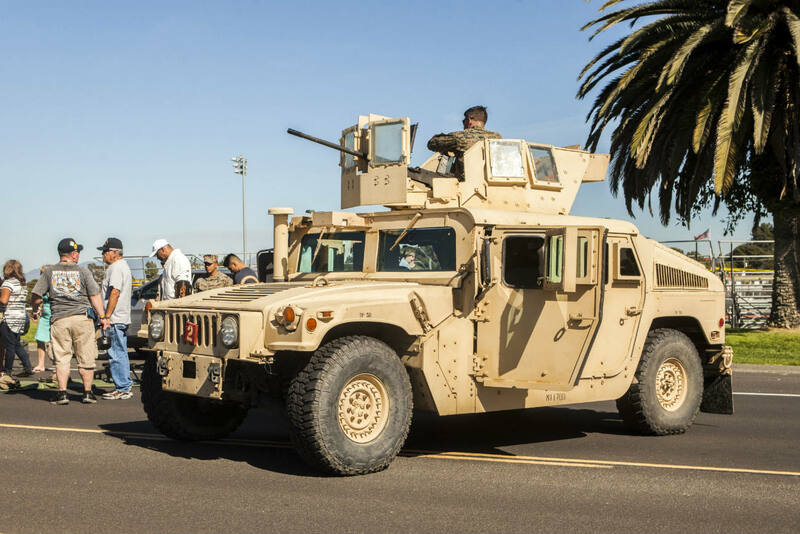 Approximately 30 Soldiers participated in the driver training, which spans across a five-day training schedule. Reserve Soldiers from the greater Chicago area drive M1165A1 High Mobility Multi-purpose Wheeled Vehicles (HMMWV) on an off-road driving course. 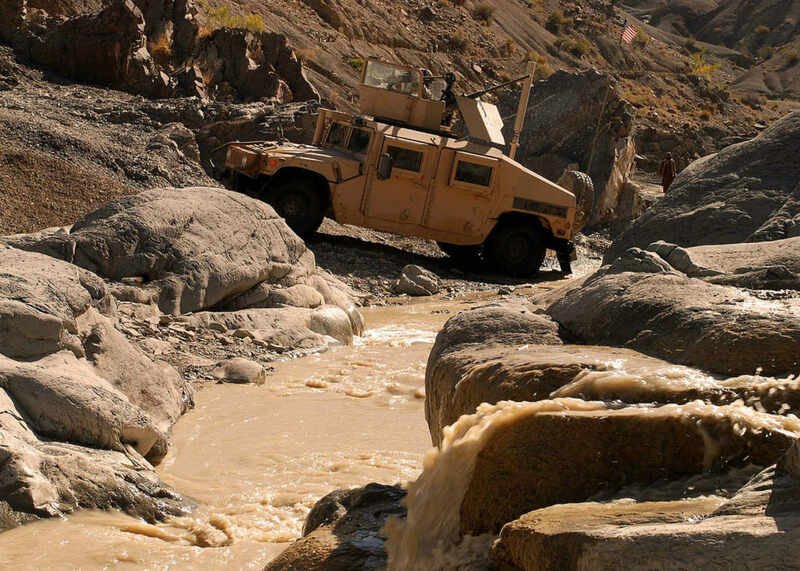 A Humvee from the 782nd Brigade Support Battalion, 4th Brigade Combat Team, 82nd Airborne Division Market Garden Combat Logistic Patrol navigates a difficult stretch of terrain on route to Forward Operating Base Orgun-E in Paktika Province, Afghanistan. 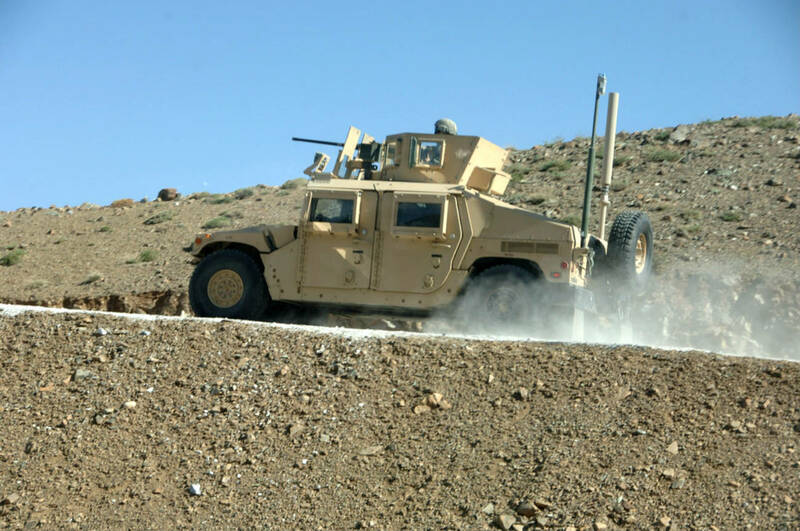 A humvee patrols and navigates a difficult stretch of terrain. These images of Humvees were photographed by military veterans and service members. U.S. Army Staff Sgt. 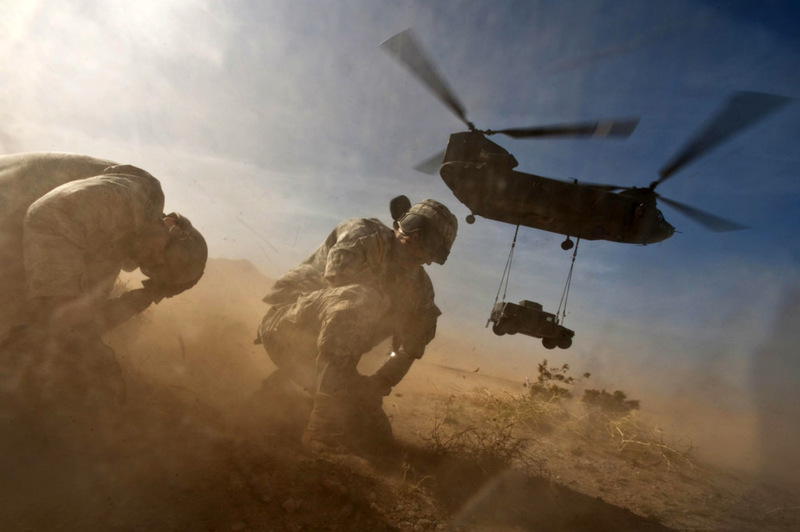 Hector Hoyas (right), an aerial delivery field service department instructor, and Air Force Senior Airman Matthew Phillips, turn away from the rotor wash as a Nevada National Guard CH-47 Chinook helicopter takes off with a Humvee at Nellis Air Force Base, Nevada during sling-load training. CH-47 Chinook helicopter takes off with a Humvee at Nellis Air Force Base. A Paratrooper from the 1st Battalion, 325th Airborne Infantry Regiment, 2nd Brigade Combat Team, 82nd Airborne Division dismounts a Humvee and moves into position during the battalion’s live fire exercise as part of the brigade’s intensive training cycle on Fort Bragg, North Carolina. 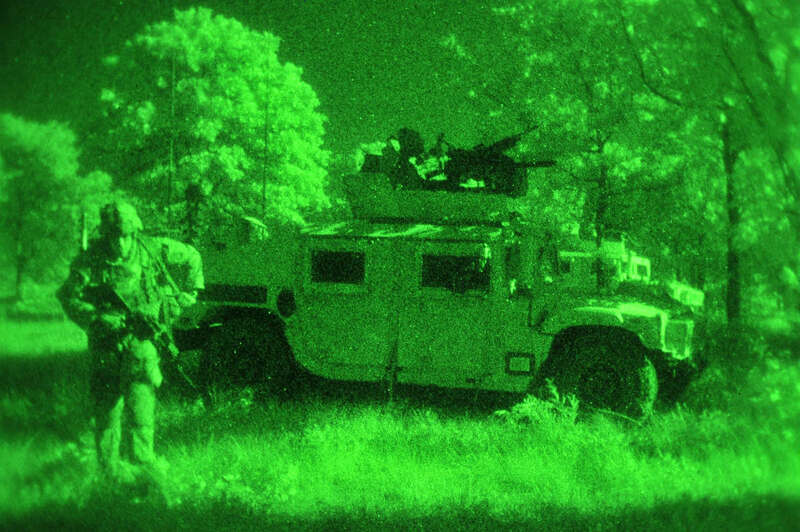 82nd Airborne Division dismounts a Humvee and moves into position during the battalion’s live fire exercise. Soldiers with the Illinois National Guard's 3637th Maintenance Company load their Humvees before moving out to provide road-side assistance to stranded motorists on Illinois interstate highways. 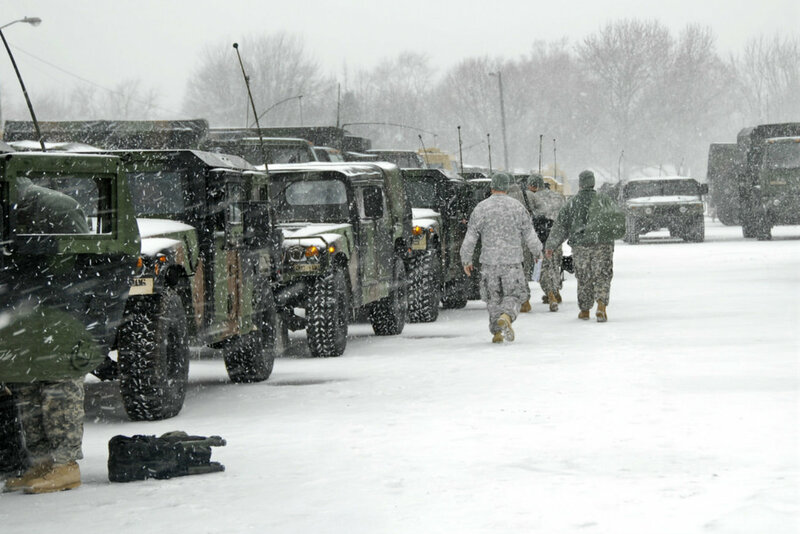 Soldiers with the Illinois National Guard’s 3637th Maintenance Company load their Humvees before moving out to provide road-side assistance to stranded motorists on Illinois interstate highways. Anti-tank assaultmen with Weapons Company, 3rd Battalion, 3rd Marine Regiment, crouch next to a Humvee as a fellow missileman fires a Tube-launched, Optically-tracked, Wire-guided missile during the Enhanced Mojave Viper training exercise at the Black Top Range Training Area on Marine Corps Air Ground Combat Center Twentynine Palms, California. The Marines of 3/3 are working through the 35-day exercise, their final evaluation before deploying to Afghanistan’s Helmand province in support of Operation Enduring Freedom this fall. During EMV, the infantry battalion is training in the field bolstering infantry skills and practicing counterinsurgency operations. 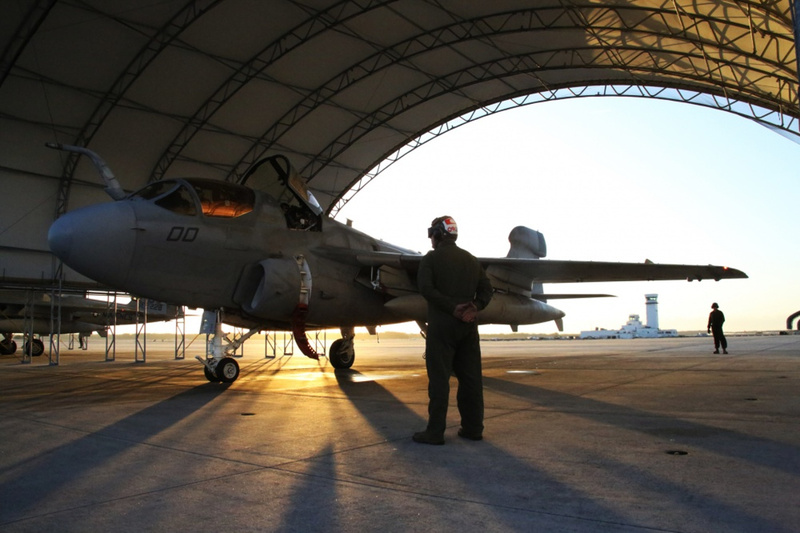 The Marines will combine with supporting arms, aviation and logistics units, and train to fight as a Marine Air Ground Task Force to prepare for deployment. Anti-tank assaultmen with Weapons Company, 3rd Battalion, 3rd Marine Regiment, crouch next to a Humvee as a fellow missileman fires a Tube-launched, Optically-tracked, Wire-guided missile. Cpl. Aaron Pickett, an anti-tank missilemen with Weapons Company, 3rd Battalion, 3rd Marine Regiment, fires a Javelin missile from the front of a Humvee during the Enhanced Mojave Viper training exercise at the Black Top Range Training Area on Marine Corps Air Ground Combat Center Twentynine Palms, California. The Marines of 3/3 are working through the 35-day exercise, their final evaluation before deploying to Afghanistan’s Helmand province in support of Operation Enduring Freedom this fall. During EMV, the infantry battalion is training in the field bolstering infantry skills and practicing counterinsurgency operations. 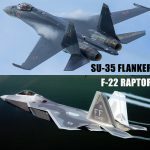 The Marines will combine with supporting arms, aviation and logistics units, and train to fight as a Marine Air Ground Task Force to prepare for deployment. 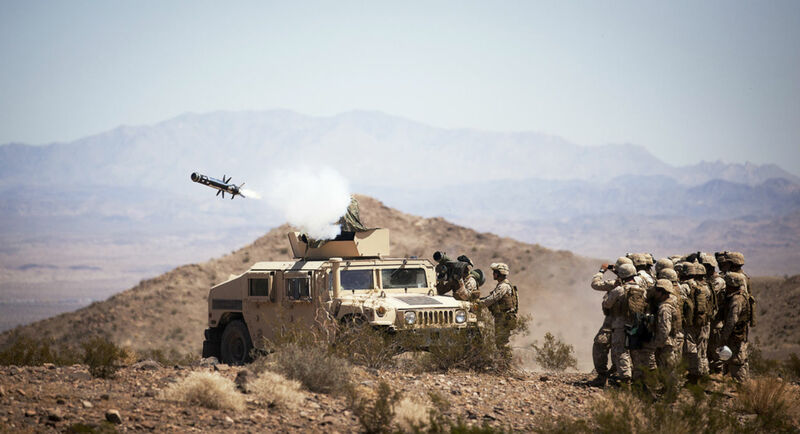 Anti-tank missilemen with Weapons Company, 3rd Battalion, 3rd Marine Regiment, fires a Javelin missile from the front of a Humvee. These images of Humvees were photographed by military veterans and service members. Pvt. 1st Class Collin R. Hoffmeyer, a gunner with 32nd Cavalry, 1st Brigade Combat Team, 101st Airborne Division, fires a Tube-Launched, Optically-Tracked, Wire Command Data Link Missile from the turret of a Humvee Dec. 6 at Observation Point-12 in Fort Knox, Ky. 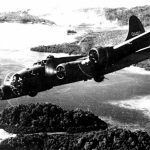 The squadron was training here in order to complete their gunnery tables. A gunner fires a Tube-Launched, Optically-Tracked, Wire Command Data Link Missile from the turret of a Humvee. 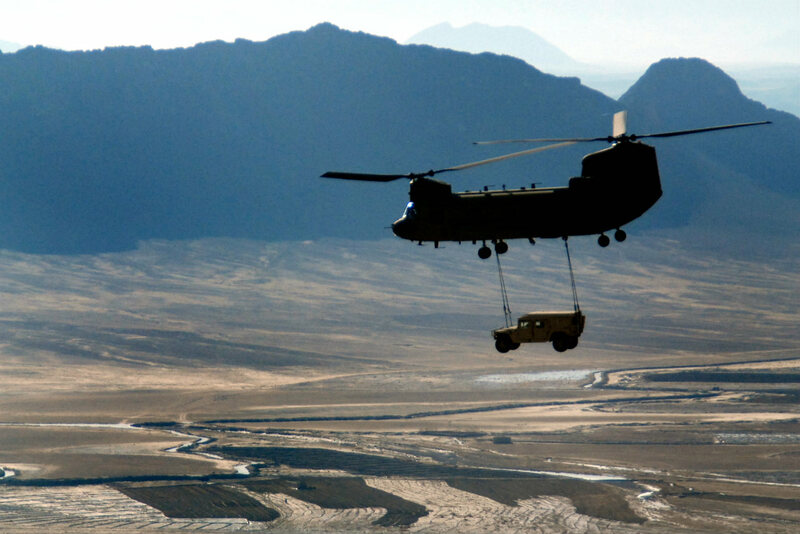 A U.S. Army CH-47F Chinook helicopter sling-loads a Humvee over Kandahar Province, Afghanistan. 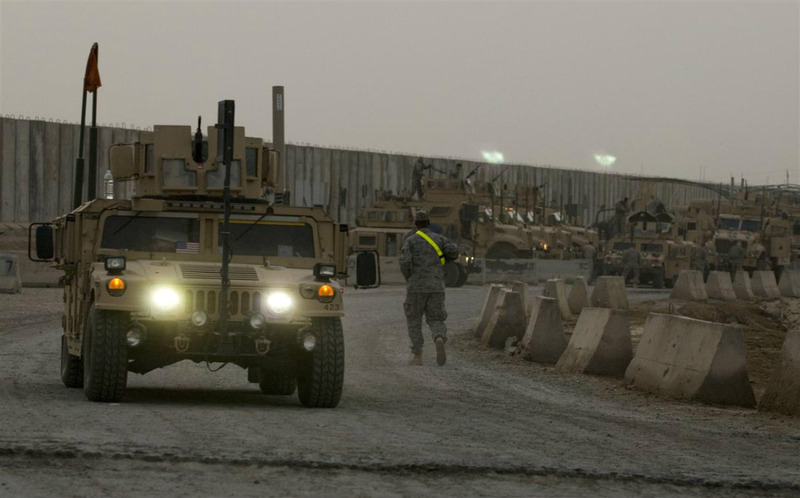 This Humvee prepares for a convoy mission inside the yard at Convoy Support Center Scania, Iraq. 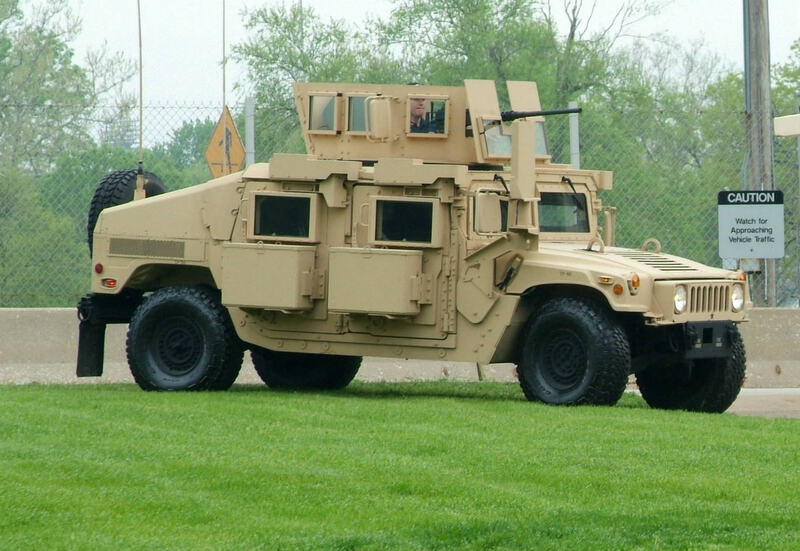 The military's Humvee is manufactured by AM General, an American company in South Bend, Ind. 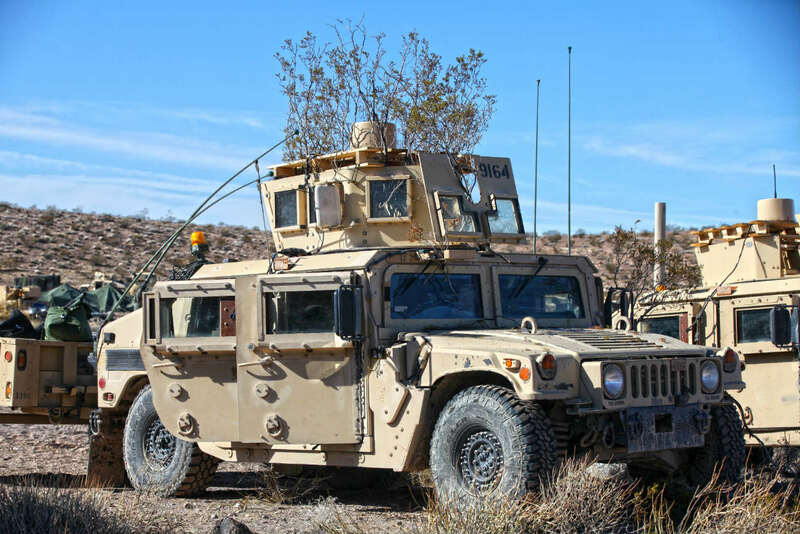 General Motor's decision to sell to a Chinese manufacturer their Hummer brand of vehicles, which shares a common background with the Humvee, will not affect where the Humvee is made. This Humvee prepares for a convoy mission inside the yard at Convoy Support Center Scania, Iraq. A high-mobility, multipurpose wheeled vehicle (HMMWV) stands guard on the flight deck of the amphibious assault ship USS Bataan (LHD 5). The ship and its ready group are deployed in the U.S. 5th Fleet area of operations in support of maritime security operations designed to reassure allies and partners, and preserve the freedom of navigation and the free flow of commerce in the region. A high-mobility, multipurpose wheeled vehicle (HMMWV) stands guard on the flight deck of the amphibious assault ship USS Bataan (LHD 5). A HMMWV from Killer Troop, 2nd Squadron, 11th Armored Cavalry Regiment, maneuvers to reinforce elements of Gunslinger Troop, 2nd Sqdn, 11th ACR, to defend the BTG stronghold near the Strawberry Fields in the National Training Center. This phase of NTC Rotation 17-07 challenged the “Dixie Thunder” Brigade’s ability to capture key terrain, which is well-defended, against a near-peer opponent. A HMMWV from Killer Troop, 2nd Squadron, 11th Armored Cavalry Regiment, maneuvers to reinforce elements of Gunslinger Troop, 2nd Sqdn, 11th ACR. These images of Humvees were photographed by military veterans and service members. x All of the HMMWV's of the 2-12th come loaded with necessary cargo that will allow soldiers to hit the ground running. 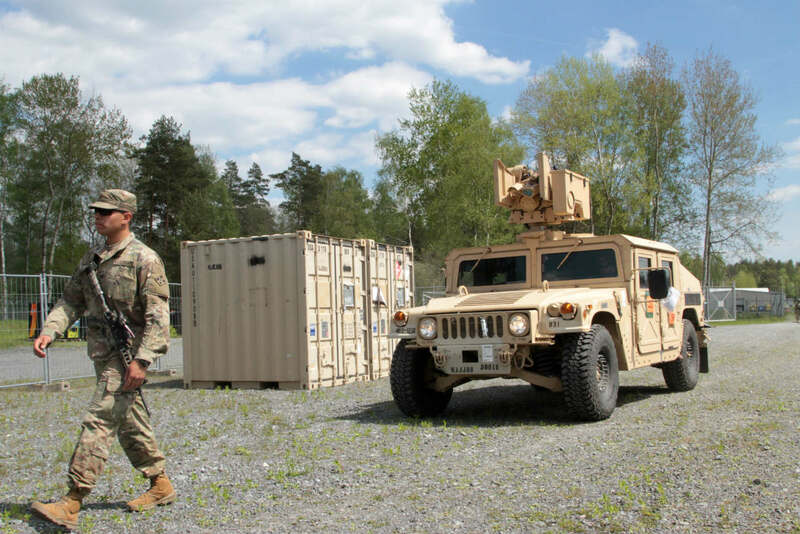 The 2-12 IN Soldiers flew to Europe with only two weeks of advance notice for an emergency deployment readiness exercise, which showcases the US Army's ability to move troops around the world at any time. A High Mobility Multipurpose Wheeled Vehicle (HMMWV) at a loading yard to download equipment at Camp Kasserine, Grafenwoehr Training Area, Germany. A High Mobilility Multi-Wheeled Vehicle camouflaged by the Electronic Warfare Group from 1st Stryker Brigade Combat Team, 25th Infantry Division at the National Training Center, Ft. Irwin, California. The National Training Center conducts tough, realistic, Unified Land Operations with our United Action Partners to prepare Brigade Combat Teams and other units for combat while taking care of Soldiers, Civilians, and Family members. A High Mobilility Multi-Wheeled Vehicle camouflaged by the Electronic Warfare Group from 1st Stryker Brigade Combat Team, 25th Infantry Division at the National Training Center, Ft. Irwin, California. 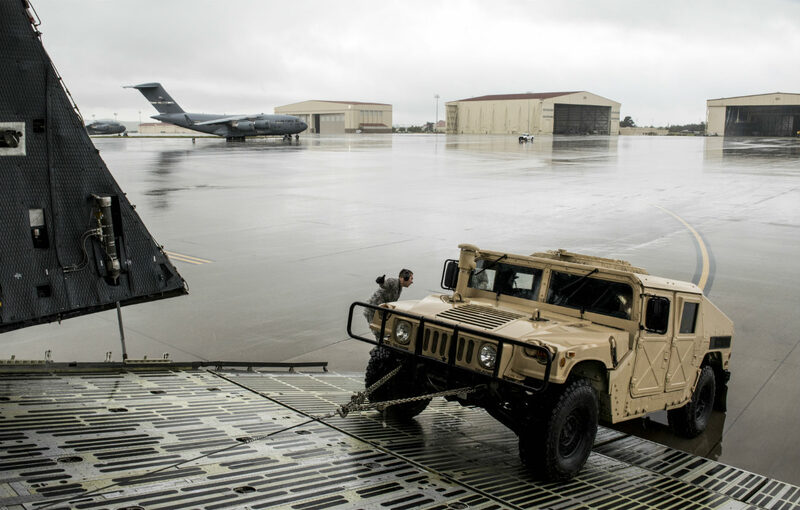 U.S Air Force aircrew members for the 22nd Airlift Squadron work to load and secure a High Mobility Multipurpose Wheeled Vehicle (HMMWV) onto a C5-M Super Galaxy aircraft during the Works with Airmen Program. The program involves wing leadership interacting with Airmen to get a detailed view of each mission performed at Travis. U.S Air Force aircrew members for the 22nd Airlift Squadron work to load and secure a High Mobility Multipurpose Wheeled Vehicle (HMMWV) onto a C5-M Super Galaxy. Soldiers from Headquarters and Headquarters Company, 301st Maneuver Enhancement Brigade, maneuver through difficult terrain on Joint Base Lewis-McChord, Washington. The city of Tacoma, Washington, receives an average rainfall of 40 inches of rain per year. Soldiers from Headquarters and Headquarters Company, 301st Maneuver Enhancement Brigade, maneuver through difficult terrain. A U.S. Marine Corps HMMWV vehicle is displayed at the Battle Color Ceremony at the 11 Area parade field on Camp Pendleton, California. The ceremony featured vehicle displays for the COUGAR MRAP, LAV-25-A2, and the M1114 HMMWV. A U.S. Marine Corps HMMWV vehicle is displayed at the Battle Color Ceremony at the 11 Area parade field on Camp Pendleton. These images of Humvees were photographed by military veterans and service members.